Best Automatic Espresso Machine – Coffee has become an intimate and intricate part of our modern-day society – from the slightly awkward first date to the formality of the board staff meeting. It’s no real surprise it’s the second most popular drink after water and second most widely used product after oil – I’m sure that little piece of information will come in handy at the next pub quiz! The point is that coffee machines, not only at home but in the office space at work and staff rooms everywhere have become not only an added feature, but a necessary one. And whether you’re looking for value for money, versatility and the option to experiment and try your hand at being an amateur barista or possibly just the bare necessities and something simple, easy to operate and that promises to produce the goods time and time again…hopefully you’ll find exactly what you’re looking for! What exactly is an Espresso Machine? To the untrained eye, all ‘Coffee Machines’ look very similar if not exactly the same and the range available can be very overwhelming. But specifically an Espresso Machine brews coffee by forcing pressurised water, which is close to boiling temperature through a ‘puck’ of ground coffee (or if applicable an E.S.E – easy serving espresso pod) and filter in order to produce a thick, concentrated form of coffee called espresso, which allows you to make other speciality coffee drinks. Yeah, basically the temperature controls for the boiler and preset water volumes are both automated – hence ‘Automatic’. And an automatic espresso machine will also feature a pump. It’s automated! – The automatic espresso machine is very popular simply because it does everything for you! It’s all at the push of a button – you can program your machine to make your drink of choice all at the push of a button – and even so it’s all ready brewed for you when you wake up! It’s available on a budget – both semi-automatic and automatic are available very reasonably producing great tasting quality coffee drinks and looking the part too! This is a nifty little piece of kit! It’s seems kinda ridiculous to emphasise the fact that it has power cord storage as well as a used cartridge container. However, as it’s such a compact machine, these additional features wouldn’t necessarily be evident – which is kind of the point right?! Skyrocketing its utility factor as well as maintaining a cool slick design that would blend in well in any modern kitchen, even if you are struggling for counter space. However, as it is so compact, the water reservoir will need constant re-filling. In short, it’s not extortionately expensive, brews [very] quickly – in just 25-30 seconds and definitely looks the part. Not hard to understand why it’s a #1 Best Seller! 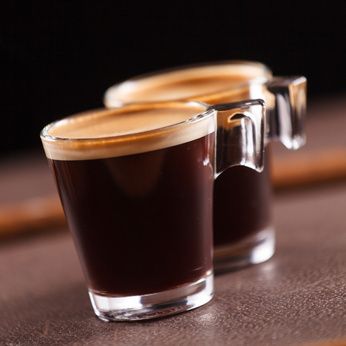 → Get the Nespresso Pixie Espresso Maker on Amazon! Gosh! This DeLonghi Magnifica certainly lives up to its name! The rather interesting price tag is definitely representative of a super-automatic machine of such reputation and quality production. With a system for anything and everything, you’ll feel like you need an engineering degree just to turn it on, but really you just need to remember the terms well enough to keep your company entertained – while the machine takes care of the rest! The quality standard of this espresso machine is clear to see. The Direct-to-Brew system means the beans are grinded immediately before brewing resulting in fresh, quality-tasting aromatic espresso. And if you so desire, the cappuccino system will produce a rich, creamy froth – all at the touch of a button. If anything and it really depends on individual taste – it just lacks aesthetic appeal! Which let’s be honest is the thing we hope attracts attention and at that price tag, you’d maybe expect a bit more. 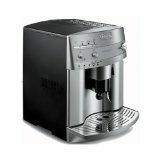 → Get the DeLonghi ESAM3300 Magnifica Super-Automatic on Amazon! Passion. Precision. Perfection. That’s the Krups mandate and in their quest for perfection they’ve given us this fully automatic espresso machine. Are you convinced yet?! Everything about this model, from the colour, to the design, to the description fills you with confidence that here you’ve got a quality product you can trust. Conventionally stylish – it’ll immediately feel like it’s been a permanent feature in your kitchen. I love the little LCD-display – complete with images, which will walk you through the process of making the absolute most of this extremely versatile piece of kit. 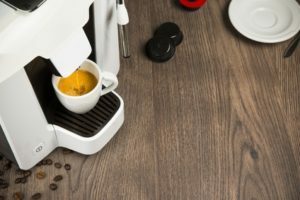 If you’ve got money burning a hole in your pocket and want to really enjoy the full experience a home automatic coffee maker has to offer – this is definitely worth consideration! → Get the KRUPS EA8250 Espresseria on Amazon! Possibly one of the most adaptable machines on the market! The real hallmark of this Philips Xelsis fully automatic espresso machine is its multi-function capabilities – ideal for use in a family of coffee-lovers. It’s even got the option of personalising up to 9 drinks for 6 individual users. It’d be easy to fall into the trap of simply regurgitating the long list of details regarding all this machine has to offer including the dual boilers, ceramic adjustable grinder and personalised options but the most important thing to emphasise here – is that the designers at Philips have indeed paid attention to detail, and it’s definitely worth a read for yourself! → Get the AECO HD8954/47 Philips Xelsis EVO on Amazon! It may not look like much but this Gaggia Brera Superautomatic Espresso Machine certainly has a lot to offer! It’s even said to be the new face of traditional Italian espresso. If you could sum up this espresso machine in a word – it’d be solid. A four-stage water filtration system taking the step to remove impurities to a whole new level; intelligent LCD-display that even notifies users when it’s in need of some TLC and designed specifically for low-energy consumption; all comprised in a durable, compact and sleek stainless-steel casing, it really isn’t any wonder this appliance is receiving such accolade. 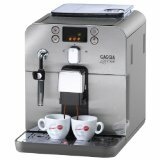 → Get the Gaggia Brera Superautomatic Espresso Machine on Amazon!